Dry eye is a common symptom, and is commonly caused by insufficient tears being produced, or instability of the tear film on the eye. Other symptoms also commonly experienced when the eye is dry include burning, gritty/foreign body sensation, red eyes, tired eyes, and blurred/variable vision. 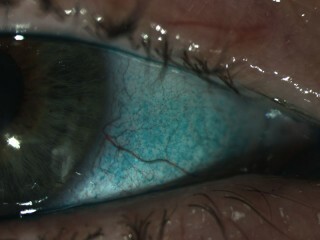 If the tear film is unstable rather than deficient, the eye may paradoxically water in response to the sensation of dryness. This is where the main lacrimal gland, positioned underneath the outer third of the upper lid, and/or the accessory glands, scattered over the conjunctiva, fail to produce enough tears. This may occur simply to ageing, particularly around the menopause as a result of hormonal changes; following viral conjunctivitis or chemical conjunctival injury; or secondary to inflammation in the lacrimal glands, usually associated with dryness of the salivary glands (Sjogrens syndrome). Sjogrens syndrome may occur on its own (Primary Sjogrens syndrome) or as part of more widespread inflammation, e.g. Secondary Sjogrens in Rheumatoid arthritis. 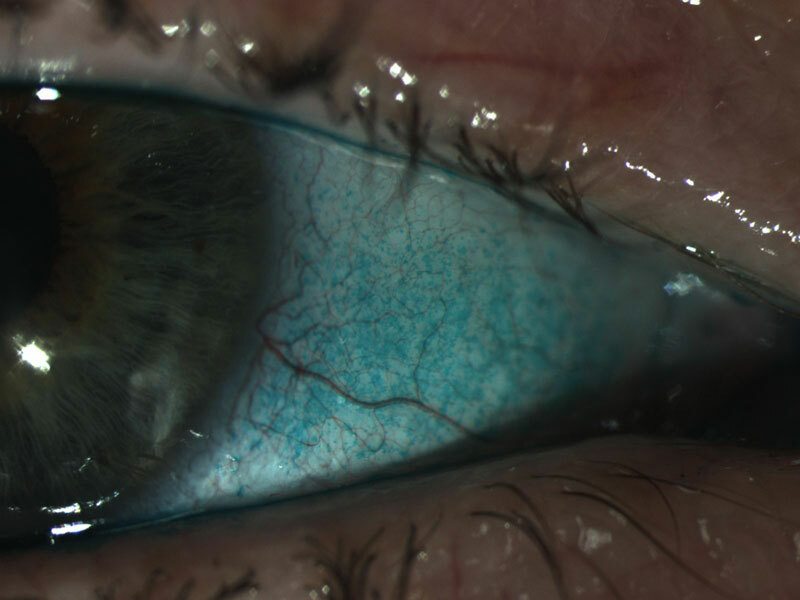 This occurs when the normal balance between the oily, mucinous and aqueous (watery) parts of the tear film becomes upset. 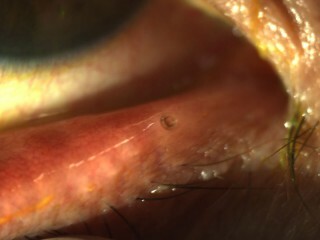 The tear film can be seen to break up rapidly on the eye, even when present in good volume. It may occur in isolation, but is more common as a result of blepharitis, or inflammation of the eyelid margins. If a specific cause can be identified, then treatment (e.g. correction of eyelid position, or removal of pterygium) may cure the symptoms. Otherwise it is necessary to treat the symptoms, either by supplementing the tears, or taking steps to preserve the tears that are made. Dry eyes sometimes resolve on their own, so do not get despondent if the problems seem to continue for some time. Sometimes, just avoiding environments known to exacerbate the symptoms, e.g. smoky rooms, can make a big difference. Any cause of dry eye will respond to tear supplementation, either as artificial tear drops or ointments. They are unlikely to cure the symptoms, but often make them manageable. They range from watery and therefore easily tolerated but short-lasting, to thick and oily, which last a long time but may make the eyes feel ‘sticky’, and blur the vision. There are many different manufacturers, and it may be a case of trying a few to see which suits you. I can advise you which to try first, depending on the cause of your dry eye. Avoid red-eye drops, which constrict the blood vessels on the eye to make it look whiter. They work, but will make your eyes redder than ever once they are stopped because of their rebound effect . If using drops more than 6 times a day, switch to a preservative-free perparation. Multiple-use bottles get contaminated after a while, and therefore include a chemical to kill some bacteria. Unfortunately, these preservatives are themselves toxic to the eye if used too often. Tears normally drain away from the ocular surface via tiny tubes (punctum) on the lid margins near the inner corner of the eyes. These can be blocked, either temporarily using dissolving plugs, or permanently using permanent (but removable) silicone plugs or by surgery. The procedure does have a risk of causing watery eyes, so I always perform a reversible or temporary procedure first, using punctal plugs rather than surgery. Plugs can be inserted in clinic after anaesthetic eyedrops – the procedure is quick and painless. If dry eyes are severe, and causing damage to the eyes, then the eyelid aperture can be narrowed to reduce evaporation from the surface. This is done by carefully sewing the outer part of the eyelid edges together, a procedure called tarsorraphy. It is permanent, but can be reversed if necessary, e.g. if tear production improves. Pilocarpine tablets may help in dry eye and dry mouth, but have side effects of headaches, palpitations, sweating etc. and are often poorly tolerated. Cyclosporin eye drops have been shown to help some people, although the best-tolerated preparation (‘Restasis’ 0.05% preservative free) is not licensed in this country and is not available for general use.